Terese M. Roland Piano Tuning is a locally-owned piano tuning and repair service, dedicated to helping you maintain your instrument. I tune any size or type of piano and my knowledge, experience and attention to detail means your piano will sound significantly better, even after just one visit. Let me give your piano the love and attention it needs to play beautiful music. Even to the untrained ear, an out-of-tune piano isn’t going to sound right. When the notes to your favorite melody are coming out off-key or sounding strained, it’s a sign that your instrument is in need of piano tuning in Watertown, CT. This isn’t a job for just anyone, either! 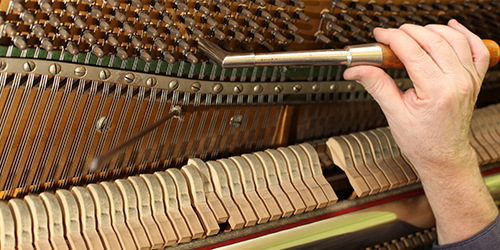 Trust Terese M. Roland Piano Tuning to provide the precision tuning services your specific piano needs to sound its best. I have the experience and skill you need when it comes to tuning your delicate piano, and I take the time to make sure every single instrument we work on is given unique adjustments for temperament and pitch. 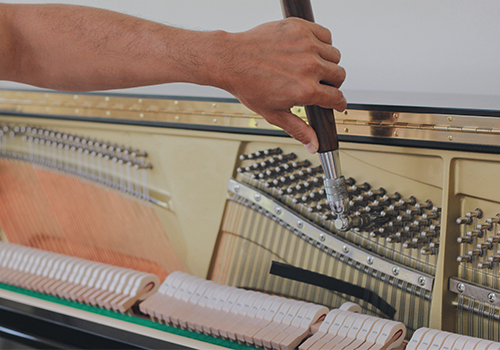 Not only am I a trusted piano tuner in Watertown, CT, my expertise with pianos also allows me to deliver minor maintenance and repair services. If there’s something not right with your instrument, give me a call and I’ll diagnose the issue. In many cases, I’ll have the tools and capabilities to set it right again. Or, if you’re thinking about buying or selling a piano, I’ll be glad to provide appraisal services to make sure you’re making the right decision. My love of pianos and dedication to my craft is what makes me your local leading expert! Schedule an appointment today! Terese has more than 25 years of experience and is a second-generation piano tuner, trained by her father. I can tune or provide minor repairs for any size or type of piano, from grand pianos to uprights and anything in between! My focus and attention are always on quality. We never tune to “good enough”— I always strive for the perfect pitch! I come equipped with all of the tools necessary for the job, no matter the piano or the tuning adjustments needed. I work with the utmost precision. I understand that every instrument is different, which is why every piano gets individualized attention and care. Give your out-of-tune piano the precision adjustments it needs to sing on-key once again! Contact me today to schedule an appointment for tuning or minor repairs.